Provide comfort for the family of Triveni Unni-Nayar with a meaningful gesture of sympathy. TRIVENI UNNINAYAR April 8th,1920-February 25th, 2019. It is with profound sadness we announce that after a long and wonderful life, with her family by her side, Triveni Unninayar passed gently into the night on Monday February 25th 2019, at the Elliott Community in Guelph. She was the cherished wife of the late Raman (1997) and will be welcomed in heaven by her beloved son Manu (2009) who was taken from all of us too soon. She was deeply loved and will be forever missed by her three children Sushel (Cynthia), Ramani (Jana) and Premila (Ravi); her grandchildren Tasha, Praseedha (Hari), Manusha (Jon), Landon (Sarah) and Rishan (Leanne) of whom she was so proud. She leaves behind four delightful great grandchildren Hadean, Seidon, Uma and Aanika - who never failed to bring a smile to her face and brighten her darkest day. She was a pioneer in her time and bravely embarked on a life which crossed cultures, race, and religion. She was a great storyteller of life in Ceylon, but her favourite story was the tale of how she and our father met. Triveni and Raman came to Guelph in 1979 to make a home with Manu. They left their homeland of Ceylon because all of us had flown away to further our studies and forge our own paths in life. Her home had an open door policy to all who needed a hot meal or simply a hug and boundless love. 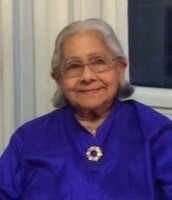 Triveni spent the last seven years at the Elliott Community where she was welcomed and treated with respect and love. She lived with dignity until her last moments and we are deeply grateful to our family doctor Dr. William Ruddock, and the Elliott staff, nurses and personal support workers who took such gentle care of her. The warmth, love and compassion she embodied touched all those around her, and we are honoured and privileged to have known her. She holds a special place in our hearts and leaves a void of unimaginable proportion. May God speed her on her journey home. A Celebration of her Life will be held from 2:00-5:00pm on Saturday March 9th 2019 at Memory Gardens Funeral Home in Breslau. At 3:00 pm, the family will share their fond memories of Triveni. https://www.canadahelps.org/en/charities/the-elliott-community/ and specify it is in memory of Triveni Unninayar. Donations are being accepted for: THE ELLIOTT. We encourage you to share your most beloved memories of Triveni Unni-Nayar here, so that the family and other loved ones can always see it. You can upload cherished photographs, or share your favorite stories, and can even comment on those shared by others.